Mostly cloudy, with a high near 80. South southeast wind around 15 mph. 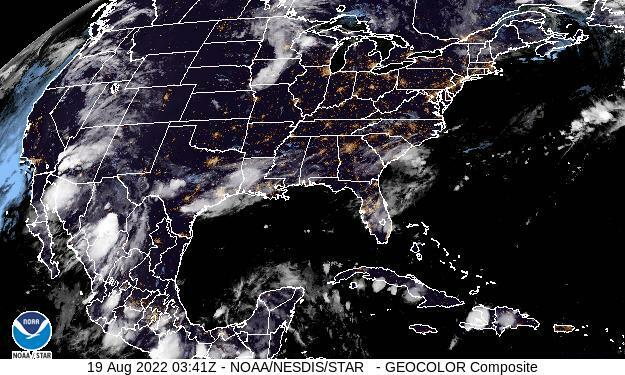 A 30 percent chance of showers and thunderstorms after 10pm. Mostly cloudy, with a low around 62. South southeast wind 10 to 15 mph. Showers and thunderstorms likely. Mostly cloudy, with a high near 71. Southeast wind 5 to 10 mph becoming east northeast in the afternoon. Chance of precipitation is 60%. New rainfall amounts between a quarter and half of an inch possible. Showers and thunderstorms. Some of the storms could produce heavy rain. Low around 57. East northeast wind around 10 mph. Chance of precipitation is 90%. New rainfall amounts between three quarters and one inch possible. Showers and thunderstorms. High near 64. East northeast wind around 10 mph. Chance of precipitation is 90%. New rainfall amounts between 1 and 2 inches possible. A 30 percent chance of showers and thunderstorms. Mostly cloudy, with a low around 54. Northeast wind 5 to 10 mph becoming west northwest after midnight. Mostly sunny, with a high near 75. North northwest wind around 10 mph. Sunny, with a high near 80. 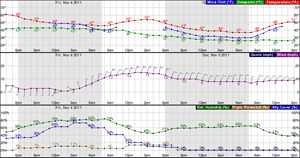 North northwest wind around 5 mph becoming east in the afternoon. Mostly clear, with a low around 58. East southeast wind around 5 mph.